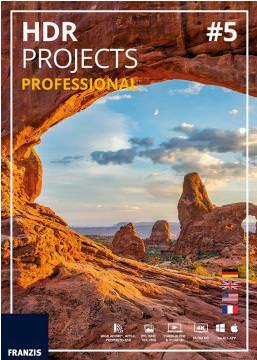 HDR Projects Professional 5 from FRANZIS has been released and with it comes several improvements. The latest version of FRANZIS' popular HDR photo editing software has been released and with it comes increased control for the user, an array of useful tools and improvements to the interface. Additional colour spaces, algorithms, tone-mapping functions, GPS locations and functions for RAW image editing have been added along with filter and mask editing capabilities and new ways to personalise your workflow. There are also an extra 21 preset-templates, which takes the total to 155, that allow users to simply click an option to apply a particular HDR effect. As well as extra presets, the software can now use up to 55 different exposures from an exposure bracket (JPEG or RAW) to create an image that uses more of the luminosity spectrum and during the image adjustment stage, there is now 8 additional standard light colour spaces so colour space adjustments are more precise. The new interactive optimisation of Ghosting Correction precisely calculates various parameter settings and automatically removes moving or displaced regions within the photograph and the manual as well as the automatic HDR Contrast optimisation options offer even more control over the compression of HDR brightness levels in your image. Two new Tone Mapping options give users more control of lighting and shadow levels in landscape and architectural photography as well as of a general soft luminosity throughout the image and the addition of 16 new post-processing effects, such as fog reduction, make it easier to improve photos. The two new HDR algorithms “Repro neutral” and “Repro intensive” can be used to bring negatives and film brought back to life digitally. 12 aperture stops gathered from the film material are used to calculate the best dynamic range so images are reproduced at the highest quality level possible. The selective Editing tool has been equipped with new functions, for example, Masks can be designated either with the Edge Detection Brush or according to characteristics such as brightness or colour tone, aspects which also help to determine the Mask Colour. There's also a new Gradient Module and a new Composing mode. Those who work with RAW files will be pleased to hear that over 900 RAW camera formats are now supported and the new automatic Brilliance Optimisation function, as well as the introduction of five other new functions, means RAW edits can be made in the software rather than users having to user an external editor. HDR projects 5 is now available in its Professional Version for $289 and in its Standard Version for enthusiasts for $149 as an ESD-Version (Download) or in a German Language Box-Version in specialised retail stores. The Software is available for both Mac and Windows and includes an integrated Photoshop Plug-in as well as an Add-on for Lightroom and Photoshop Elements. There's a free trial of the new HDR software available on the FRANZIS website. Version 4 of HDR Projects Professional received a 'Highly Recommended' award from ePz in our review.